Robert Pilot showed with the Group of Seven in their first exhibition in 1920, but did not formalize his association with them - he generally preferred subjects of inhabited landscapes, such as this fine winter scene, rather than wilderness views. Born in St. John's, Newfoundland, he was based in Montreal, but returned to Newfoundland to sketch. Quidi Vidi, a neighbourhood near St. John's, was once a historic fishing village. Pilot captures the charm of this community, depicting its inhabitants chatting over the fence and smoke rising from chimneys. The influence of Impressionism infused Pilot's work, and his mastery of soft atmospheres is seen here in the cool winter light, delicate pastels in the snow and creamy green in the ice on the inlet. The National Gallery of Canada has one of Pilot's Newfoundland canvases entitled Houses, St. John's, Nfld. in its collection. 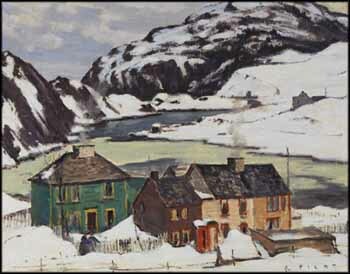 The larger canvas of this Quidi Vidi scene, exhibited in Montreal in 1968, was in the collection of the Dominion Bridge Company, the connection being that Pilot married Patricia Dawes, whose father, Norman James Dawes, was a director of this company.